Molecular imaging such as positron emission tomography (PET) and single-photon emission computed tomography (SPECT) can provide the crucial pharmacokinetic-pharmacodynamic information of a drug non-invasively at an early stage of clinical drug development. Nevertheless, not much has been known how molecular imaging has been actually used in drug development studies. We searched PubMed using such keywords as molecular imaging, PET, SPECT, drug development, and new drug, or any combination of those to select papers in English, published from January 1, 1990, to December 31, 2015. The information about the publication year, therapeutic area of a drug candidate, drug development phase, and imaging modality and utility of imaging were extracted. Of 10,264 papers initially screened, 208 papers met the eligibility criteria. The more recent the publication year, the bigger the number of papers, particularly since 2010. 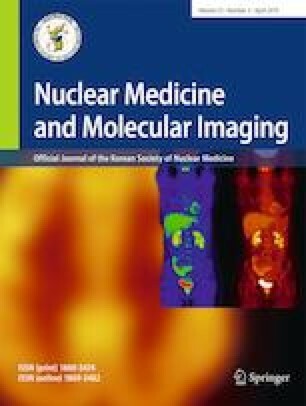 The two major therapeutic areas using molecular imaging to develop drugs were oncology (47.6%) and the central nervous system (CNS, 36.5%), in which efficacy (63.5%) and proof-of-concept through either receptor occupancy (RO) or other than RO (29.7%), respectively, were the primary utility of molecular imaging. PET was used 4.7 times more frequently than SPECT. Molecular imaging was most frequently used in phase I clinical trials (40.8%), whereas it was employed rarely in phase 0 or exploratory IND studies (1.4%). The present study confirmed the trend that molecular imaging has been more actively employed in recent clinical drug development studies although its adoption was rather slow and rare in phase 0 studies. Hyeomin Son and Kyungho Jang contributed equally to this work. The online version of this article ( https://doi.org/10.1007/s13139-019-00593-y) contains supplementary material, which is available to authorized users. This research was supported by a grant of the Korea Health Technology R&D Project through the Korea Health Industry Development Institute (KHIDI), funded by the Ministry of Health & Welfare, Republic of Korea (grant number: HI14C1072). Hyeomin Son, Kyungho Jang, Heechan Lee, Sang Eun Kim, Keon Wook Kang, and Howard Lee certify that there is no conflict of interest with any financial organization regarding the material discussed in the manuscript. Food and Drug Administration of USA. Critical path opportunities initiated during 2006. 2006. http://wayback.archive-it.org/7993/20180125075636/https://www.fda.gov/ScienceResearch/SpecialTopics/CriticalPathInitiative/CriticalPathOpportunitiesReports/default.htm. Accessed 06 Jan 2018. Pharmaceutical Research and Manufacturers of America (2015) Biopharmaceutical research industry profile. 2015. http://phrma-docs.phrma.org/sites/default/files/pdf/2015_phrma_profile.pdf. Accessed 06 Dec 2017. Tufts Center for the Study of Drug Development. Outlook 2015. 2015. https://static1.squarespace.com/static/5a9eb0c8e2ccd1158288d8dc/t/5aa2fd18f9619a2463540b42/1520631066097/Outlook-2015.pdf. Accessed 08 Jan 2018.